Even if they haven’t seen it most people know of The Angel of the North sculpture by the road outside Gateshead. 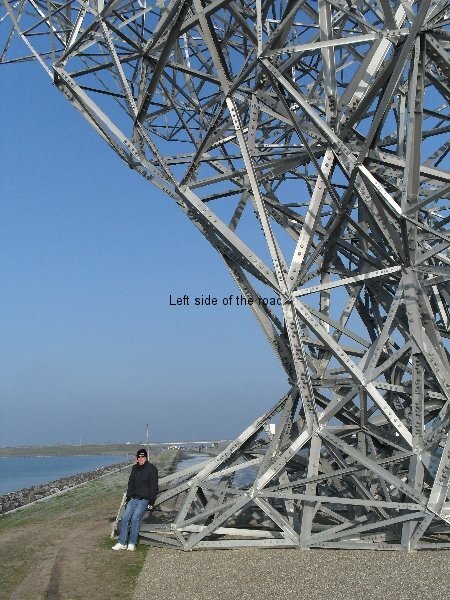 Exposure, close to the Dutch city of Lelystad is even bigger. But it took a long time to come to fruition. 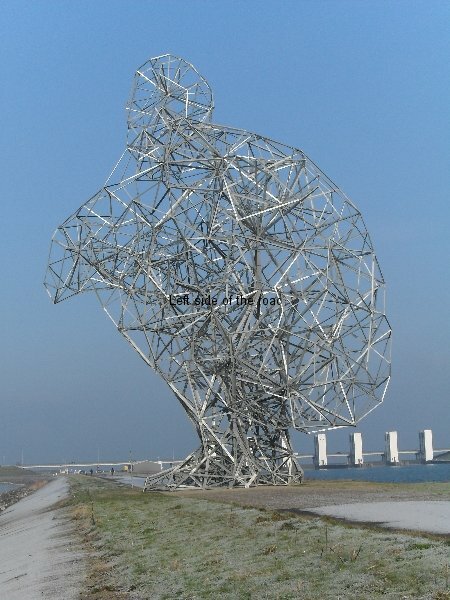 It was in 2001 that the municipality of Lelystad decided to have a competition for a major work of art to be placed between the city and the sea. 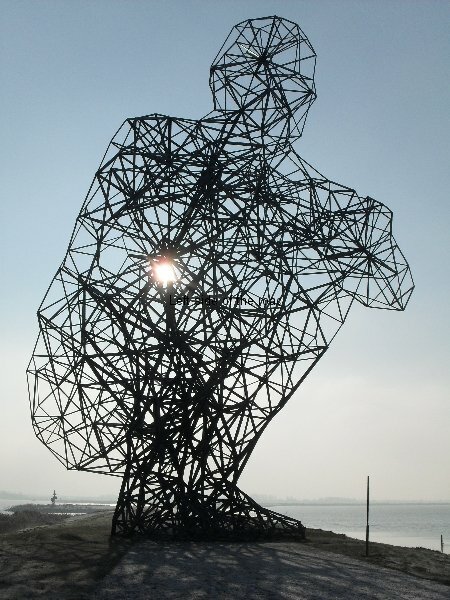 Antony Gormley won and in 2005 he was awarded the commission. Having to deal with the technical issues involved with such a huge piece of art meant that the cost started to rise and it wasn’t until 2007 that this financial problem was resolved when a major sponsor came in to foot the bill. The company Had Fab, based in Scotland and more used to putting up electricity pylons, had been involved with the project from the start and they then took 3 years to produce all the bits of this huge mecanno-like structure. 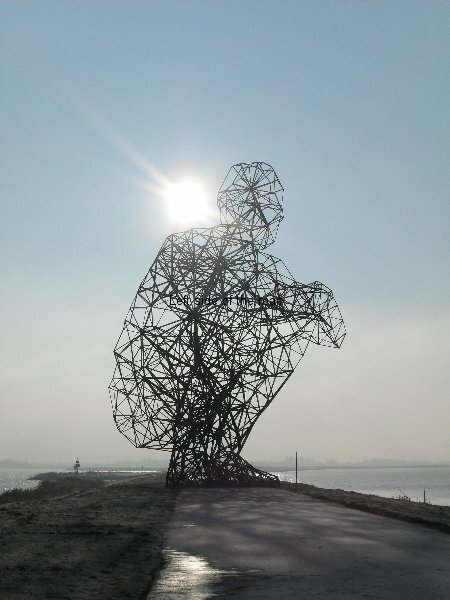 It was first put together at their works in East Lothian and then it took about a month to erect it on the prepared site, on a dam beside the Markermeer, a couple of kilometres from the centre of Lelystad. Gormley is known for basing his sculptures upon the human body, normally his own, and Exposure is no different. 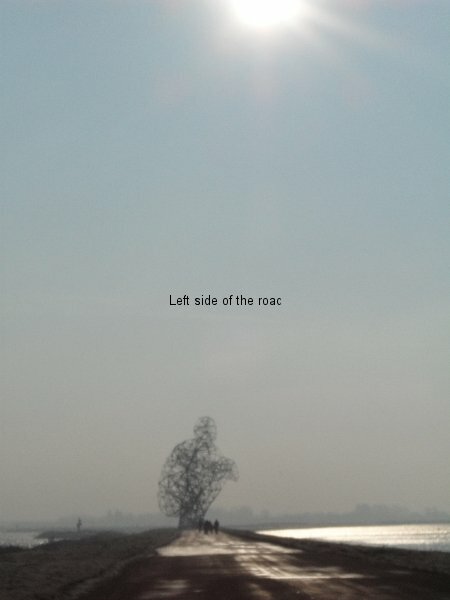 One of his other well-known works in the UK is the collection of a hundred life-sized cast iron figures called Another Place which is spaced out along a 3.5 kilometre stretch of Crosby beach, at the mouth of the River Mersey, close to Liverpool. 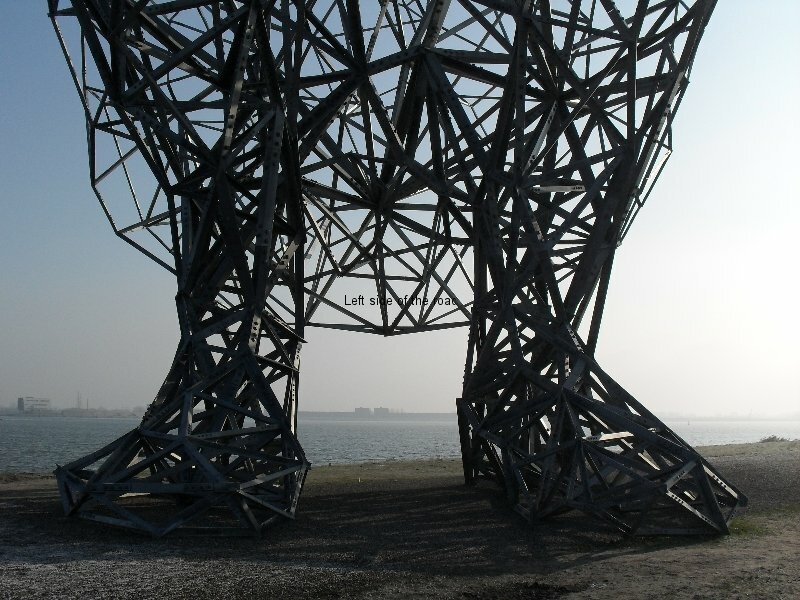 Exposure is a human figure, 25 metres high (5 metres taller than The Angel of the North) and weighing 60 tonnes, crouching and looking out to sea. There are more than 5,000 individual pieces, each of different length and size, and it’s all kept together with 14,000 or so bolts. It was officially inaugurated on the 17th September 2010. 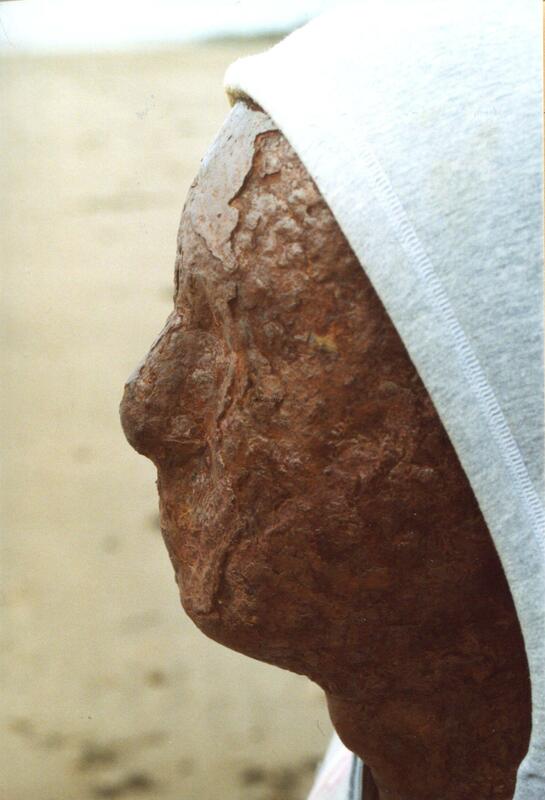 One of the things that makes this sculpture interesting is its location. It is situated on a narrow strip of land and has water the side it is looking as well as at its back. The land is part of the system of dams and dykes which prevent The Netherlands from being under water so there is no other structure close by. In that way it’s easy to imagine someone just quietly looking out to sea, thinking. 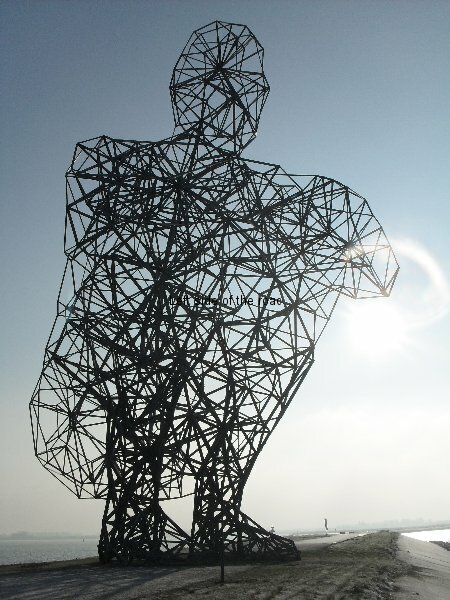 The only difference is that this figure is more than 80 feet high. Not as easy to get to as some of the sites in Holland but not impossible and well worth the effort. A train from Amsterdam Centraal takes under 40 minutes and there are 3 or 4 an hour during the day. On leaving Lelystad railway station head towards the bus station, the other side of the tracks, about a minute away. There catch the Stadbus No. 3, to Batavia Stad, a shopping complex. From there walk towards the coast and it crouches on the dam lying parallel to the shoreline. You can’t miss it, it’s big enough.